(Nanowerk News) Researchers have devised a technology that can bring true color to infrared imaging systems, like the one used to track Arnold Schwarzenegger through the jungle in the movie "Predator." Traditional infrared imaging systems may look colorful on screen, with warm objects appearing redder and whiter than their surroundings. But these images are not created from actual colors. They are based on the amount of thermal radiation -- or infrared light -- that the camera captures. The ability to identify different wavelengths -- or colors -- of the infrared spectrum would capture much more information about the objects being imaged, such as their chemical composition. Once adopted, the technique would allow advanced thermal imaging systems to not only be produced faster and cheaper than today's counterparts, but to have higher sensitivity. It could also be used in a wide variety of other applications, such as masking the heat signatures of objects. The study was published online Nov. 9 in Advanced Materials ("Large-Area Metasurface Perfect Absorbers from Visible to Near-Infrared"). "By borrowing well-known techniques from chemistry and employing them in new ways, we were able to obtain significantly better resolution than with a million-dollar state-of-the-art electron beam lithography system," said Mikkelsen. "This allowed us to create a coating that can fine-tune the absorption spectra with a level of control that hasn't been possible previously, with potential applications from light harvesting and photodetectors to military applications." 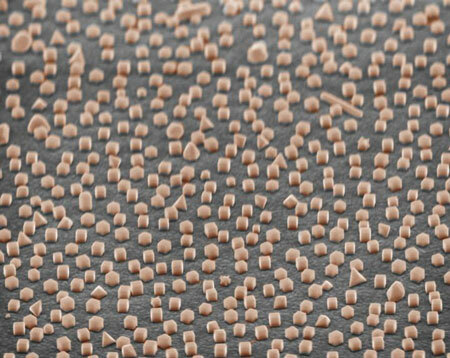 "This doesn't require top-down fabrication such as expensive lithography techniques and we don't make this in a clean room," added Gleb Akselrod, a postdoctoral researcher in Mikkelsen's laboratory. "We build it from the bottom up, so the whole thing is inherently cheap and very scalable to large areas." "What is so attractive about the film/nanocube system is its remarkable simplicity and flexibility," said David R. Smith, the James B. Duke Professor of Electrical and Computer Engineering at Duke. "The unique absorbing properties of the nanocubes can be predicted with straightforward formulas, making it easy to quickly determine recipes for surface coatings that provide desired spectral properties. The nanocube system eliminates, or at least vastly reduces, cost and manufacturing issues, so that we can focus on impacting exciting application areas such as photovoltaics or thermal coatings." For an example of the latter, if you can control the colors of light that a material absorbs, then you can also control the wavelengths of light that it emits. By making the nanocubes larger to absorb wavelengths corresponding to thermal radiation, this technology could suppress or mask an object's natural thermal radiation, otherwise known as "black body radiation." "We haven't made the device that's actually going to take that energy and convert it to an electrical signal yet," said Akselrod. "That's going to be the next step."